I do not think there is staple more misunderstood, more hated on than the humble loaf of bread. For some people the phase ”the best thing since slice bread” is a blunt contradiction and should be cast away, along with a baguette. Paleo movement being so hot right now, I fear I will soon become the minority who can NEVER live without carbohydrates. However please note bread haters, not all bread is created equal. Sure some are the bread which represent a dessert more than a common staple but please do not forget your sprouting or sourdough breads. The simple bread is never fully acknowledged for it greatness. We have reduced it worth so much that it can be simply thrown like rock or shoe. I am outraged that ANOTHER (yes this has happened before) sandwich has been sacrificed again to portray a view point at an Australian Government figure. What ever happen to simply saying, “We do not like you or your policies”? I guess when we are passionate about something we go back to our most primal instincts of throwing whatever is closest to us. Although, if I were to throw a sandwich at someone I might as well make it count something pointy and hard like a rustic baguette or something. I do not think I will be throwing bread at anyone soon (unless throwing a bagel in mouth before I run of to University counts). Today I bring you savoury loaf bread. After a few sweet posts I feel the need to indulge my habit of bread and cheese in one. 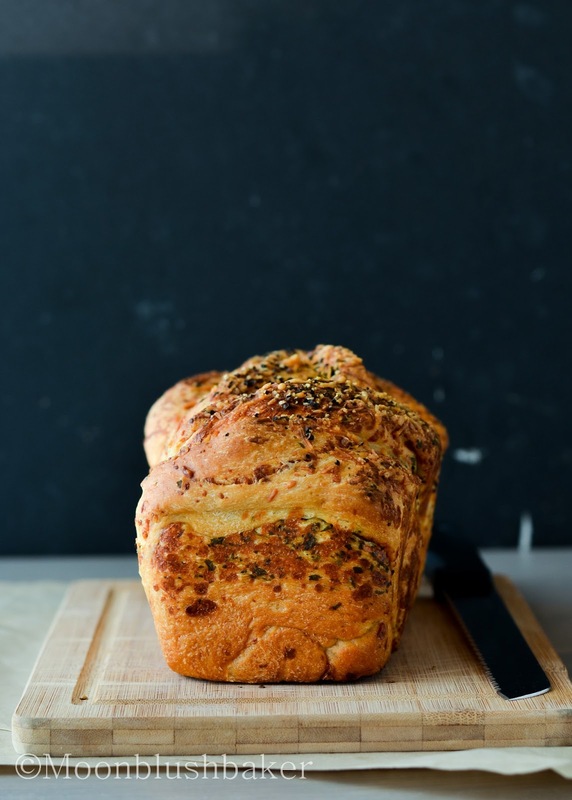 This loaf is modelled after those twists loafs you often see using cinnamon sugar or cocoa. 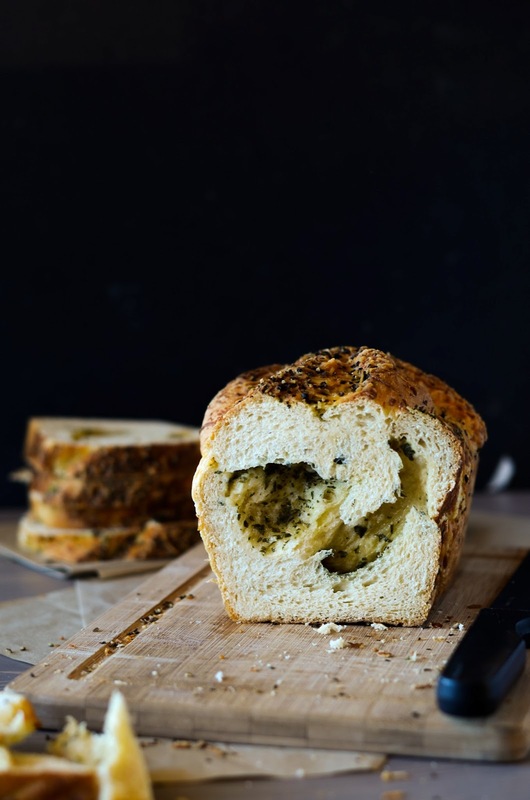 I adore the look of those and the swirls mean the flavour is not only pretty to look at but the contrast of big pockets of flavour make the loaf an exciting thing to eat . I am not deviating too far from upper soft of cheese and herb buns you see in the supermarket, I used to love these as a kid. I would so often eat the inside them save the crust to last with the burnt cheese. How do you eat bread? The crust or insides first? Are you tearier or a biter? 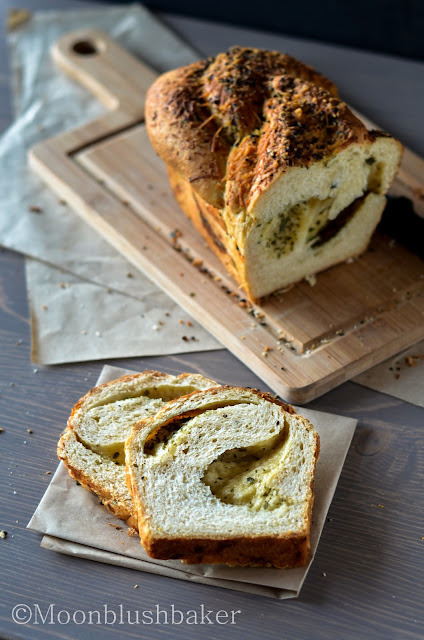 This simple half white spelt loaf with a ribbon of extra virgin olive oil, grated parmesan cheese and mixed herbs. I am a good fan of different flours, and I have particularly fallen for spelt. 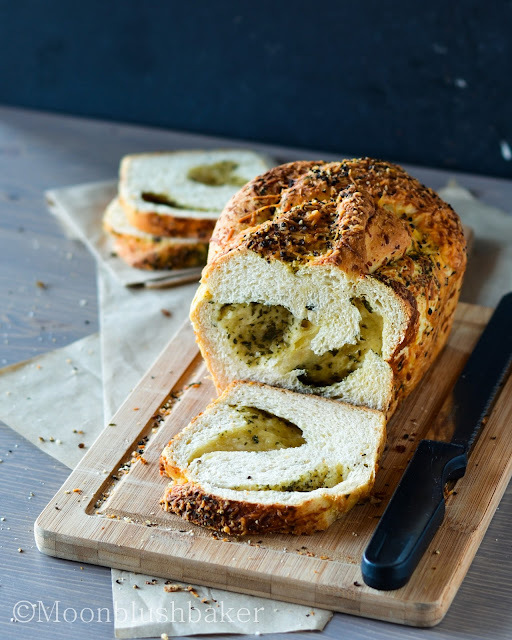 The big holes of crusted cheese mean that experience of saving the crusty bits to last can be experienced throughout the bread. I know most of think bread is hard but really like most things it just takes experience to learn what works. 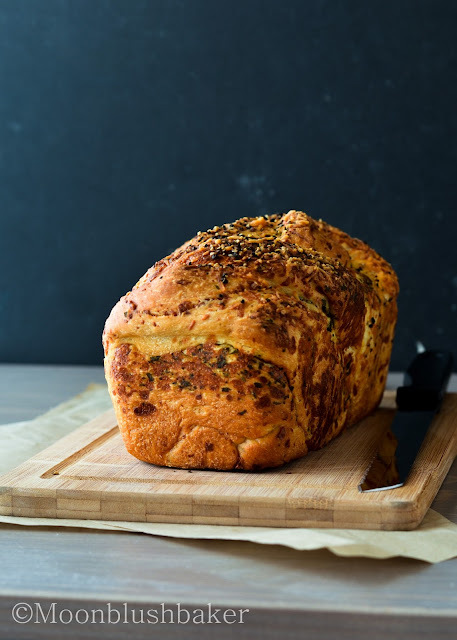 Be adventurous this week in the kitchen and cook up loaf, any loaf to celebrate the wonder of bread! Egg wash of one egg plus 15ml water. Activate yeast in the mixture of warm water and sugar. Allow to sit for 20 minutes or until foamy. Pour in yeast mixture and knead on a well-floured surface. The mixture will be wetter than normal dough, but knead for about 30-40mintues by hand. Knead until it has the ability to hold itself up into a round shape. Pre heat oven to 200C. Grease, line and flour your loaf pans. I used a small Asian loaf pan so I had to make two, but the standard 1 pound loaf tin will deal with this amount dough nicely. Punch down dough once doubled. Roll out dough into a rough rectangle, brush on olive oil and sprinkle your cheese and herbs. Be firm when you roll up the loaf like a Swiss roll. Cut the log length ways to revel the stripped cheese insides. Brush with egg wash and sprinkle your cheese and black pepper on top. Proof again for 1 hour, covered with cling wrap. Once bake, cool for 5 minutes and turn out on to cooling rack. Sheri I will try that next time, Thank you for the tip! Thanks gemma! You latest post looks so good, Chocolate heaven! You have no idea how much your comment makes me feel better about my diet! I hope the world spreads that carbs not are evil! 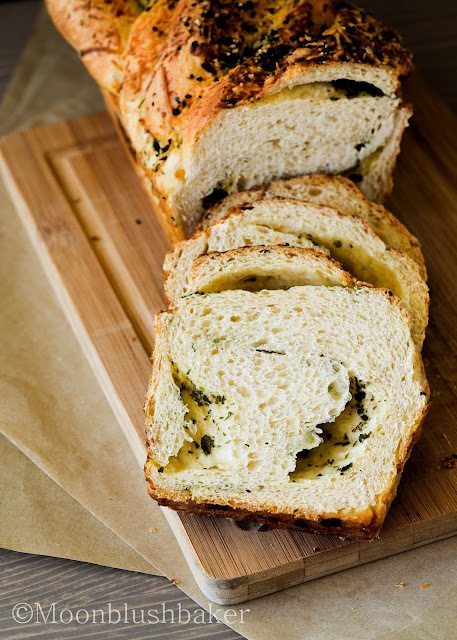 Enjoy the bread if you make this weekend. I have to second Deanna’s comment above – I am studying to take the exam to become a registered dietitian, and although I think people CAN live healthfully without bread (if that’s their prerogative), I would personally die a little inside if I felt I needed to give it up…even moreso if all the breads in the world looked as outrageously amazing as yours right here does. Thanks for a great post and what looks to be a great recipe! I love the filling swirl! 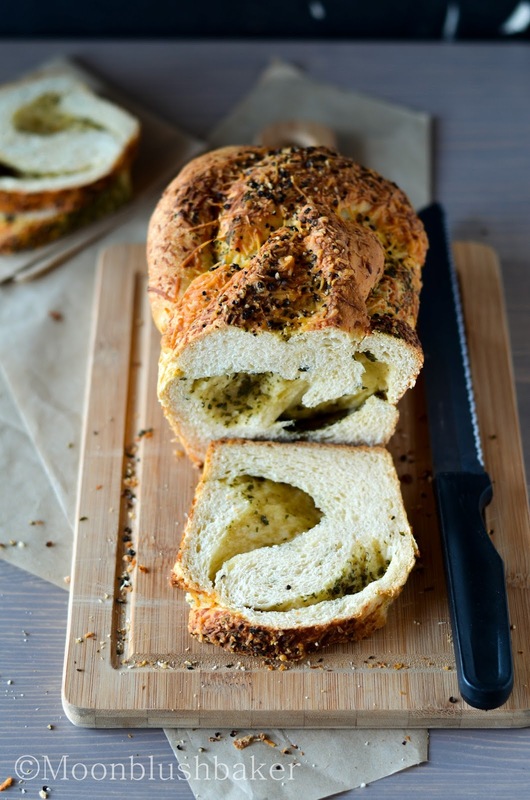 I really wish i could eat bread….i think i might be allergic to gluten! crying over here. ENJOY for me! fantastic recipe! those herbs and cheese in the middle are making my mouth water. Paleo is so funny I think. All in moderation is my basic motto! It seems like every time I ask a question, the answer is right in front of my face, but how much chia and milk powder do you use? Thanks! OH!!! I am very sorry! I forgot to add the milk powder to the recipe. Chia is optional as I adapted it from a previous sweet bread I maade, you can add up to 30 grams of chia. HOLY SHIZNIT THIS IS LIKE THE BEST LOOKING BREAD I’VE SEEN! !Must make it one day! Oh btw ,whats a white spelt bread flour? White spelt flour is not made for bread but I have used a bit of vital gluten per 500g of white spelt in order to improve it strength.